The pace. This tour has been designed to be more moderately paced than other tours. Gwyllyn the Bard. An evening entertainment with songs, stories about Scottish history, Jacobites, plus his work on the Outlander set. Inverness Tours. 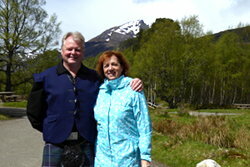 Diana herself recommends Inverness Tours and the guides Hugh Allison, Ian Deveney and Laura Moon have been guiding Outlander tours for years and they are also familiar with the TV series. Plus they know all the best lunch stops. AND... Hugh and I found "the hill"!! The October 2015 tour was there when they were setting up for filming and actually got to see the Standing Stones on the hill!! And finally, me. I am an IATAN Accredited Travel Agent and Outlander fan just like the rest of you. 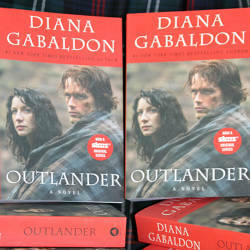 I've watched the Outlander TV series (multiple times - except the last 2) read all of the Outlander books (well 1/2 way through MOBY). I create individual blogs for each of the tours so you can get to know each other before the tour. And I have traveled - a lot - including a recent trip to Scotland to check out all of these places. 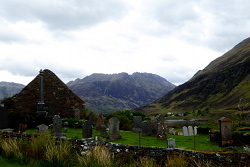 So I can give you general tips on travel as well as tips on Scotland specifically. See some testimonials here. Arrive Glasgow and transfer to your pre-booked accommodations. On your own, see some of the sites used for the Outlander TV series including Pollok Country Park and George Square. 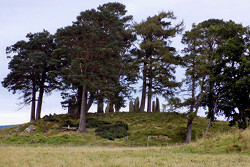 The park was used for the outside of Castle Leoch (where Claire searches for medicines and herbs) in the film version of Outlander. You should also visit the easily accessible historic George Square which was used as the film location of when Frank proposed to Claire. In the evening, we'll have special entertainment provided by 'Gwyllyn the Bard' who played for Jamie and Claire in Castle Leoch in the Outlander tv show. Gwyllyn will entertain you with songs, stories about Scottish history, plus his work on the Outlander set. Overnight in Glasgow. After a good nights sleep and a full breakfast, travel to Doune Castle, the film location for Castle Leoch with plenty of time to look around and listen to the interesting audio guide as well as time to take loads of pictures. Next stop will be Falkland the village that was used for Inverness in the Starz TV Series "Outlander". 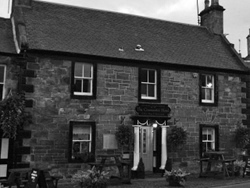 Stop at the Covenanter Hotel and recall the hanging sign for "Mrs Baird's Guesthouse, est. 1865". Walk around the town and see the Falkland Parish Church and wander around the area surrounding the Bruce Fountain where Frank saw the ghost. Continue on to to Loch Rannoch which looks like where Claire recited the poem in the tv series. And we'll see "the hill" where the filming of the standing stones occurred. (If you're lucky, like the October 2015 Outlander Immersion tour - you'll actually get to see the standing stones on the hill.) Overnight in Aberfeldy. Today we will journey to the 18th century village where 'Rent' was filmed and you'll be able to see the hut where Dougal ripped Jamie's shirt down the back in the TV episode of Outlander. Lunch on your own possibly at the Glen Hotel. On to Culloden Battlefield for a exploration of the new visitor's center and a walk around the (paved) moors to see the Fraser clan stone and the memorial for all clans. 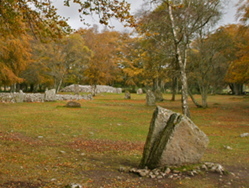 Next stop is Clava Cairns. This is the location that has a split stone like the one in the Outlander book that Claire went through. It also has a large single stone like the one that Claire put her hands on in the TV series. (Possibly a stop at Culloden House). Overnight in Inverness, the city that Clarie was looking for but couldn't see the lights of the city in 1743. Back to Inverness for the night. Travel through the scenic highlands to Glen Affric. A walk through this glen will take you into the remains of the Great Caledonian Pine Forest where Jamie and Claire wandered after their wedding. 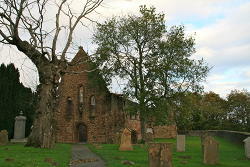 Next visit Beauly the seat of Clan Fraser and Beauly Priory where Claire liked to go for solitude. Then stop for lunch at the Storehouse of Foulis (a fully restored 18th century storehouse). We'll finish the day at 'Lallybroch' (a house that looks like the book version of Lallybroch) for afternoon tea and a fabulous weapons presentation by our guide. Back to Inverness for the night. Begin with a drive down the shores of Loch Ness, where, in the book, Claire saw the Water Creature. Photostop at Urquhart Castle. Then it is west through Dundreggan, where, in the book, the story is told of the Farmer whose wife is stolen by the Fairies. As we reach the West Coast we visit the ruined chapel that Diana used as her inspiration for the Church of St Kilda. Then it is over Mam Ratagan Pass to see two of the best-preserved Brochs on the Scottish mainland. From Glenelg we will take the charming community ferry to the mystical Isle of Skye, and will hear some of the tales of the fairies that are said to inhabit that island. Returning to the mainland by bridge, our return to Inverness will take us along the shores of Loch Garve known from Outlander as the home of the water kelpie. Back to Inverness for the night. En route back to Edinburgh we'll visit the charming Royal Burgh of Culross. 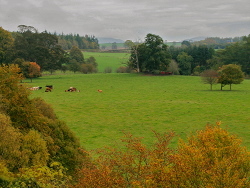 This was the film location for Gellis Duncan's Cranesmuir in the TV version of Outlander. Culross is a fascinating example of a town that time has forgotten. 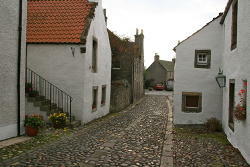 The Town House was built in 1626 and was the administrative centre of Culross with a tollbooth and witches prison. Next stop will be Blackness Castle which stands in for Fort William in the TV version of Outlander. 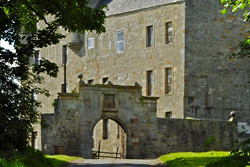 We'll also stop by the site used for Lallybroch in the tv series if it is available this day. Overnight in Edinburgh. 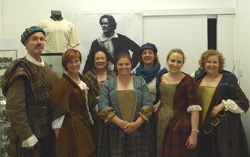 In the morning we will be going to a costume shop to be outfitted with our period costumes for wearing on a guided walking tour of the Royal Mile. Our fabulous tour guide will lead the tour down the Royal Mile pointing out all the places from Outlander including the World's End, White Horse Close and Holyrood. We'll end the day with a festive dinner wearing the clothes Jamie and Claire might have worn. Overnight in Edinburgh. This morning transfer to the airport for your flight home (or you may choose to extend your stay and see more of Scotland). On the final day in Edinburgh, we will have period costumes to wear around the city and for Traditional Scottish Evening. The price for this tour is $2279 per person double occupancy for land only, $2864 for a single room. Prices are subject to change until final payment is made.